Coffee chains such as Starbucks, Costa and Nero are on every corner, but making coffee at home is also having a huge resurgence in the UK, with booming sales of everything from pod machines to bean-to-cups. One less trendy way to make coffee is with a percolator: these simple jugs force water through compacted coffee using science, and are actually a very convenient way to make great coffee. If you’re feeling really nostalgic, then the coffee percolator is where it’s at. A percolator create a more intense flavour than a filter machine or cafetiére, but the results are not quite the same as espresso. Done right, it's delish, anyway. To brew coffee in a percolator you need ground coffee beans – pre-ground is okay, freshly ground beans are better. You load up the ground coffee into the section above the water chamber of the percolator and as the water boils it pushes through the coffee and filters it out again. You can use any type of coffee, although darker, espresso-type beans are better suited than lighter, artisan blends. Stove top percolators are the most authentic type and can be used both at home and when camping. They come in numerous sizes – generally measured by how many 'cups' (they mean smaller espresso-type cups rather than hulking, Starbuck-style vats) they rustle up. You can get very big stove-top percolators, but they do naturally tend to be a little slow, unless you use an induction hob (where compatible – do check) on high heat. Electric ones are larger on average, and can be more convenient and efficient for larger families or for using in the office or anywhere else that lacks a hob. 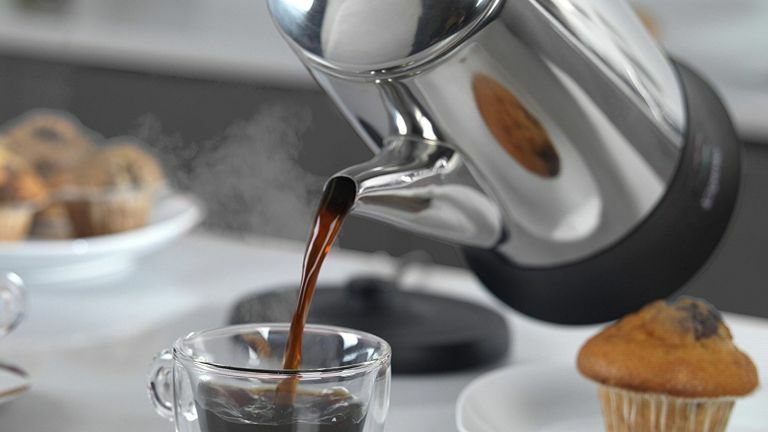 We’ve picked out some of the best coffee percolators on the market to suit your coffee needs. This small yet classic percolator is ideal for anyone who can’t go without their morning coffee. It makes enough for two cups of very intense, espresso-esque coffee. You can, of course, add boiling water for a longer, Americano-style drink. The Bialetti Brikka is a stove top device, so it takes a few minutes for the coffee to brew but it's well worth that piffling wait. This percolator is not dishwasher safe, but it is very easy to clean, once you master tapping out the used coffee into the bin, before going to the sink. Those requiring more coffee of a morning will find their are numerous Bialetti percolator size options to choose between. If the whole family or flatshare craves coffee first thing, this electric percolator is a great little device. Its stay warm function will help you all get your coffee fix. It's large, and can brew up to 10 cups in about 10 minutes. A handy neon light turns green when the drink is ready. The cordless base means it looks sleek and smart in any kitchen and the automatic switch off kicks in after 45 minutes so you don’t have to worry about accidentally leaving it on. The stay warm mode works really well, keeping the brew at a good drinking temperature, without totally stewing, and thereby screwing, your beverage. This Lakeland percolator boasts no frills, but it is great for someone who want s the same kind of results as the Bialetti Brikka, but with a different approach to styling. Unlike the Bialetti, it works with any type of hob, including induction and is dishwasher safe. However, we'd advise using a lower induction setting, and we wouldn't recommend dishwashing it anyway, unless you only use it rarely. Flavourwise, you're better off rinsing buy hand rather than blasting it with chemicals every day. It is also is a little trickier to empty the ground coffee than on its Italia rival. Still, the retro look works well if you’re all about the aesthetics in your kitchen, but don't wan to go Full Roman. With a capacity of up to 8 cups you’ll have more than enough caffeine to get you going in the morning. Another strong and sturdy percolator that's built to last, this has a permanent filter basket which is easy to clean, and is popular with campers as well as home users. You’ll find this one takes a little while to heat up and brew, but the results justify the time taken. Business meetings just got a whole lot easier with this 12 cup percolator. You can brew barista quality coffee in a matter of minutes for the whole boardroom with its 1.8L capacity that can make up to 7 cups. It also has a keep hot feature if you want to use this at home for yourself (if you think you can drink 7 cups of coffee in a day), and users found it to be easy to clean due to its integrated filter. This coffee percolator from West Blend is both stylish and functional, looking similar to a kettle, and very at home on any kitchen counter. A clear lid lets you monitor the brewing process, while the handle and base stay cool to touch. The generous, 12-cup capacity and keep warm function mean you don’t have to brew a new cup every time you need it. It's ideal for offices, then. If you often go camping, then you don’t have to forgo a decent cup of coffee of a morning, even when you’re in the great outdoors. Any of the stovetop models here can fit the bill, but this stylish enamel percolator is more specifically designed to be used in the great outdoors. The enamel finish means it's (relatively) happy over fires, as well as on a stove top. It comes in either blue or green speckled enamel and has a clear, heat resistant viewing knob so you can see when your coffee – up to 8 cups of it at a time – has been perfectly brewed.